In America, there is Popeye’s and KFC. In the Bahamas, we’ve got places like Bamboo Shack and Sammy’s. They are the go-to spots when you’re looking to get an old fashioned greasy chicken and fries kind of meal. We have KFC too, but there’s something about the way ketchup and hot sauce merges with grease from a deep-fried thigh, fries and roll on the side, all wrapped with a wax paper covering and put into a brown paper bag, hence chicken in the bag. While the photo above may not be chicken, it’s another great thing about our chicken in the bag joints: it doesn’t have to be just chicken. We are a people that loves us some seafood, so on most menus, there is going to be a seafood option(s). 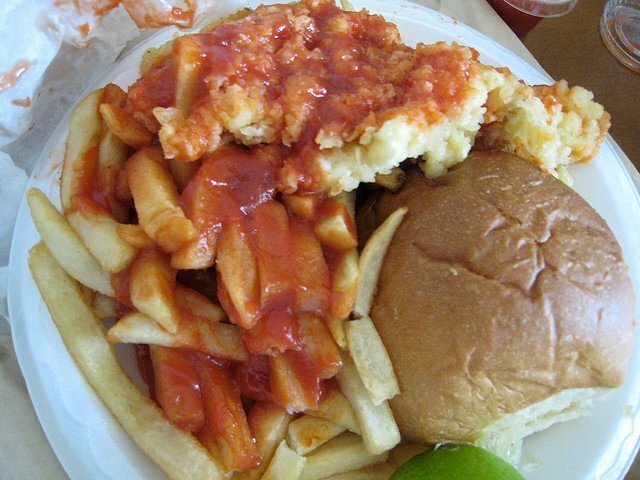 Fish burgers, conch burgers with a side of fries can hit the spot after a late night of partying. Imperials is known especially for the late night party goers because they stay open until 5 a.m.. The food isn’t anything special but I’ve heard it’s good for soaking up the alcohol in your system. My favorite food from Bamboo Shack is the jerk thigh snack with mild jerk sauce. The hot jerk sauce is literally life altering! Jerk is mostly known for being a Jamaican dish but Bahamians have made a good name in having some pretty good jerk as well. This sort of food should not be eaten everyday but rather occasionally as a guilty pleasure food. Right now Bamboo Shack should be paying for all this free advertising (lol), but if you’re in Nassau and craving some greasy food, check out their CARIFTA (Caribbean Free Trade Association) Games specials they have going on. I did not know they served ribs and they even have veggie burgers now!